This is utterly shocking. You're better than this NPR. You can't just toss around the "billion" word like you have scientists in the field counting each and every mouse/rabbit/bird/human baby casualty. The only thing I can understand on this list is the human baby. Babies are just habitual line-steppers. First years on Earth are meant to cry, sleep, throw up, and line-step. They're literally too dumb to understand anything and routinely need to get checked by cats. 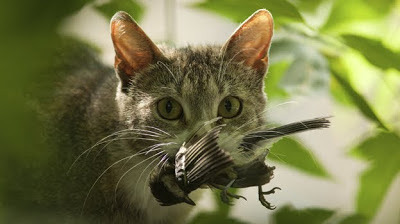 Like I said, it's completely understandable that cats kill human babies, but BIRDS, RABBITS, and MICE? Unfathomable.